Chapada will on Saturday bid to join Second Coming and Monaco Consul as winners of the Gr.1 Victoria Derby (2500m) at Flemington for trans-tasman trainer Michael Moroney. Moroney has a proud record in Derbys, with Great Command, Cut The Cake and Xcellent all winning the Gr.1 New Zealand Derby (2400m) and Monaco Consul going on to add the Gr.1 Queensland Derby (2400m) to his tally. "We've been lucky in Derbys. I think we've won half a dozen of them. This is a race we've got a proud record in and hopefully we can enhance it on Saturday," Moroney said. "Chapada’s really well. He looks pretty ready to He looks nice and bright. We've given him a stayer's preparation and he's done a good job to handle He hasn't done the racing that some of our previous Derby runners have had. "He’s always been our Derby horse. He's a natural stayer. He's always had a good racing brain right from day dot. From the time he got working as a young horse, he was always professional. He can get on the toe now and again, but on the whole, he's been pretty straightforward." It hasn't been entirely plain sailing for Moroney with Chapada though, a hoof abscess leading to more than a week of missed work in September at a crucial stage of his preparation. However, he bounced back with a five-length maiden win at Wangaratta leading into his second at Caulfield and Moroney believes he has his charge peaking at the right time. Chapada has drawn barrier 12 and Moroney is hoping Kiwi jockey James McDonald can slot in just behind the speed, which he expects to come from both inside and outside the Bullet Train youngster. "He's got really good gate speed. He should just get across and get a lovely run behind him." Chapada, who will race in the colours of Kiwi part-owner Gerard Peterson, goes into the Derby with just four starts under his belt, but TAB bookmakers have him as a realistic upset chance at $13. Moroney has further reason to be upbeat going into Melbourne Cup week with European imports Vengeur Masque and Sound Check giving him a notable hand in the $A7 million Group One 2 m feature next Tuesday. 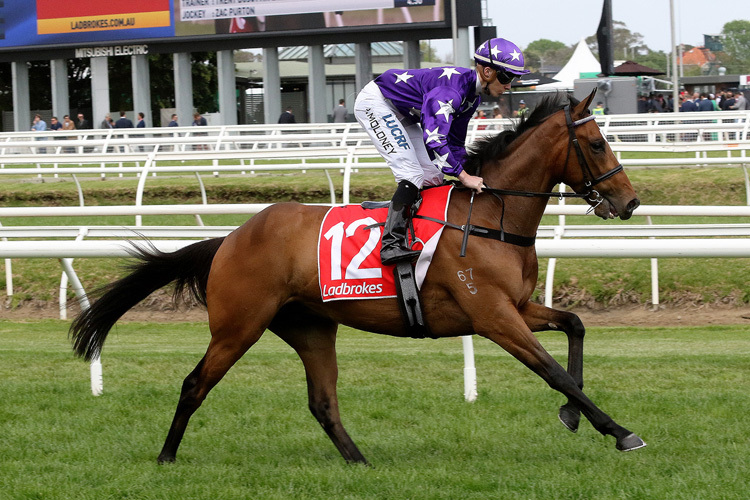 The pair had no luck in a Gr.1 Caulfield Cup (2400m) that wasn't run to suit either, with Vengeur Masque finishing ninth and Sound Check 12th, though both finding the line encouragingly late. "The Caulfield Cup you can just about wipe the race, it was terribly-run," Moroney said. "I was really happy with both my horses. We are going into the race without either horse being favoured but we can make a strong case for both of them. I really think Vengeur Masque is my biggest chance of winning a Melbourne Cup since I had [2000 Cup winner] Brew so fingers crossed."